GEORGE ROUTEDGE & SONS, LTD.
HANS STADEN'S book is not altogether unknown to English readers, for it was translated and issued by the Hakluyt Society to its members in 1874, with an Introduction and notes by Sir Richard Burton. It has long seemed to me that Hans Staden deserves a wider public, and I have therefore made a new translation and have incorporated the quaint and interesting woodcuts which were printed in the first edition, and which must have carried wonder and terror into many a German home in the 16th century. Sir Richard Burton was British Consul at Santos for some years, and knew the country of Hans Staden's captivity very intimately, and by the courtesy of the Council of the Hakluyt Society I have been enabled, as occasion arose, to make use of certain of his notes. In every case where I have done so I have added the initials R.B. The first translator, Mr. A. Tootal, worked from the Frankfurt edition of 1557, which was a reprint without the original woodcuts. The true first edition was issued at Marburg on Shrove Tuesday, 1557, by Andres Kolben at the sign of the Clover Leaf, and this is the edition from which my translation has been made. Apart from the woodcuts the differences are not many, but a point has been cleared up here and there, and a whole paragraph has been restored in Chapter XXXIII of Part II. I desire to express my thanks to the Council of the Hakluyt Society for the permission indicated above; to the Royal Geographical Society, and particularly to its Librarian, Mr. Ed. Heawood, for advice and assistance; to Professor R. Häpke of Marburg University for information concerning Dr. Dryander, the learned Marburg professor who first introduced Hans Staden to the world; to the publishers for the willingness with which they acceded to my request for the reproduction of all the woodcuts; and to my wife for much help in checking and proof-reading. Staden's spelling of proper names is most erratic. I have not attempted to correct him except in the case of well-known places such as Dieppe, Lisbon, Antwerp, etc. It seemed useless to print Depen, Lissebona, Antdorff, or Lunden, but where necessary I have added the modern names in brackets after Staden's rendering, or in the notes. I have no knowledge of the Tupi language and have left the Tupi words as Staden printed them, but here again there is no consistency. Kawi, a drink, has three different spellings, and the Tupinambá are sometimes called Tuppin Imba and sometimes Tuppin Inba. The first edition of the book is very scarce. I have worked on a beautiful copy in the Grenville Library at the British Museum. THE woodcuts which adorn the first edition of the book and which are here reproduced are very remarkable, even if they are not quite up to the standard of mid-sixteenth-century work in general. They must have been executed under Hans Staden's personal supervision, and he figures in nearly all of them. He is easily recognized by his beard, and in many of them his hands are raised in prayer. The artist seems to have placed his initials, D.H., on the ship's flag in the illustration on p. 33, but it has not been possible to identify him. The lower of the two woodcuts on p. 163 has the initials H.S., but these are probably inserted to identify Hans Staden who stands immediately below them. Counting the ornaments on pp. 18 and 125, but excluding the map, there are fifty-six woodcuts, namely thirty-three in Part I. and twenty-three in Part II. Of these three are duplicated. The woodcuts appear only in the Marburg edition of 1557. The reprint at Frankfurt-a.-M. in that year has a number of fanciful woodcuts, drawn apparently from a book on Turkey or the Near East. There are pictures of elephants and camels, veiled ladies and walled cities, not one of which has any bearing on Hans Staden and his adventures. The Marburg woodcuts, on the other hand, do really illustrate the story. Many of them are very much alive and help us to see the country and the people, and to realize something of the hardships which the traveller had to endure during his captivity. inhabitants, how they are called, and the manner in which their countries adjoin each other. This I have contrived according to the best of my ability for the better understanding of each judicious reader." There is an interesting note at the right-hand corner of the map by the tail of the sword-fish: "Here Amazons are said to dwell, as I was told by the savages." The legend was well established by the sixteenth century. Another German, Ulrich Schmidel (1534-54), went off in search of the Amazons, and Purchas adds a characteristic note: "The Amazons are still further off. I doubt beyond the region of Truth." For the Stories of the Amazons in S. America see G. Friederici, Die Amazonen Amerikas, Leipzig, 1910; Southey, History of Brazil, 1810, I, p. 604; and generally Archiv für Anthropologie, V (1872), pp. 220-225. Pages 33, 35. Two drawings of ships. Page 36. Shows Cape de Gell (Arzilla) and the capture of the boat. Page 38. The ship surrounded by fish as described on p. 37. Page 41. An interesting view of Garasu with some business-like cannon inside the enclosure. Below is the food-party on its way to Itamaraccá, while the attackers are throwing down trees across the channel. Page 42. The harbour and settlement of Buttugaris, and the fight with the French ship. Page 44. See woodcut on p. 35. Page 46. The haven of Supraway (Superaqui). Page 49. The island and harbour of S. Catharina with the settlement of Acutia and the cross described on p. 50. Page 56. The shipwreck, with Hans Staden reaching shore on a kind of raft. This woodcut (compare with that at p. 65) gives an excellent idea of the country described in the book. On the mainland is Brikioka (Bertioga), and adjoining, in Santos harbour, are the islands of San Vincente and Santo Amaro. To the right is the harbour of Itanhaen, where the shipwrecked sailors were cared for. Page 63. Hans is captured on the island of Santo Amaro. An Ingenio (p. 62) is shown on the mainland. Below is Hans praying in the boat. Page 65. The attempted recapture. Hans is seen in a boat holding a gun. At the extreme corner of the island of Santo Amaro is the bulwark in which Hans Staden was stationed. The legend reads: "The bulwark in which I, H.S., was." This woodcut should be compared with the sketch map at p. 58. Page 67. Hans lying on the ground praying. Page 68. Hans beseeching God to drive away the storm. Page 72. Inside the settlement at Uwattibi (Ubatúba). Hans is being shaved. Page 73. Hans with head-dress and rattles beating time while the women dance. Page 80. Hans with his legs tied together. By him is the king's son wearing the Enduap (p. 144). Page 82. The attack on the settlement. Page 83. Hans praying while the angry moon looks down on the huts. His prayer is written above his head: "O Lord God, rescue me from this danger and bring it to a peaceful end." This woodcut is interesting as it shows the savages smoking. There is no reference to this custom in the text, but other travellers speak of it. See, e.g., Purchas (reprint), XVI, pp. 425-6. Page 87. Hans preparing to lay hands on the sick. The victims of the pestilence are being buried in holes by the huts. Page 96. Hans in the boat speaking with the crew of the Portuguese ship. Page 100. This shows Hans attempting to bleed the sick slave, the slave being dispatched with the club, and his body being cut up. Page 102. Hans escapes to the French ship, but is repulsed. Page 106. The camp at Boywassu Kange. Page 107. The fight with the Tupinikin. Page 108. The fate of the prisoners. Page 111. The other prisoners are paraded in the camp. Page 113. The miracle of the cross. Women with their children on their backs. Page 115. The fishing expedition. Hans is seen praying. The storm is shown in the background. Page 121. The fight in the harbour of Rio de Janeiro. Page 122. The homeward voyage. Page 127. Two chiefs, one with the sacrificial club, the other wearing head-dress and the Enduap (p. 144). Page 132. The huts and stockade, with heads on the entrance-posts. Page 138. This is identical with the woodcut on p. 113. Page 141. Preparing the drink. Page 144. The ornament of ostrich plumes, called Enduap. Page 148. Pots, and the rattle called Tammaraka. Page 155. This is identical with the woodcut on p. 72. Page 156. See woodcut on p. 73. Page 157. The sacrificial club, called Iwera Pemme. Page 158. Preparations for a cannibal feast. Page 159. (a) The victim being painted; (b) the club hanging in the hut (p. 157). Page 160. The victim drinking with his captors. Page 161. The victim tied with the rope Mussurana (p. 156). Pages 162, 163. These woodcuts need no comment. encountering heavy weather they reached Pernambuco on January 28, 1548. Staden's first five chapters describe his voyage out, his adventures in the neighbourhood of Pernambuco, and his return to Europe. The rest of his book is taken up with the account of his second voyage, his captivity among the savages, and his final escape. considerable exaggeration, at eight thousand men, and after a fruitless attempt by the attackers to cut off the food supplies and smoke out a food party with the fumes of burning pepper, the natives withdrew, and terms were arranged between them and the Portuguese. Hans Staden then sailed again for Portugal, where he arrived in October 1548 after an absence of sixteen months. There seems little doubt that by this time he had acquired a good working knowledge of Portuguese. by the second ship, but the third vessel was never heard of again. The crews now began to collect provisions for their voyage to Rio de la Plata, but one day a terrible calamity befell them, for the larger ship was lost in the harbour, and they were left with one ship only which was too small to attempt the voyage. For two years the survivors were forced to remain, cut off from the outside world, and supplied with food by the natives for so long only as they had hooks and knives to give them. After the supplies had given out they subsisted as best they could upon lizards, field-rats, and shell-fish, and whatever else they could catch. Finally the crews separated into two parties, one party setting off by land for Asuncion, where there was a Spanish colony, a journey which they could not expel to accomplish in less than six months, while certain of the others sailed with the ship to the Portuguese colony at San Vincente to see if a larger vessel could be freighted to complete the voyage to Rio de la Plata. Of the land party some survivors reached their destination after many hardships and dangers, but Hans Staden and his companions in the ship encountered fog and storms, and were finally shipwrecked and cast away on a desolate coast which no one could identify. Luckily a Frenchman who was running to and fro to warm himself espied some huts behind the trees. This turned out to be a Portuguese settlement, and the castaways were relieved to find that they were only two leagues from San Vincente. A ship was sent to fetch those who had remained behind, and when the men had recovered from their hardships they set to work to maintain themselves as best they could. San Vincente, where they found themselves, was situated on an island of that name formed by an inland tidal channel, sometimes called the Santos river, on which the city and seaport of Santos now stands. It was the first Portuguese colony in Brazil, and at that time, and until 1710, the principal harbour of the Captaincy. To the east of San Vincente was another island called Santo Amaro, and on the mainland and protecting one of the channels, was a fort known as Brikioka (Bertioga), which was manned by the offspring of a Portuguese exile named De Praga, who lived there with a large tribe of his children. The Portuguese were friendly with the Tupinikin, a tribe inhabiting the neighbouring country, but were in deadly enmity with the Tupinambá to the north, from whom they were in constant danger of attack. It had been decided to erect another fort on the island of Santo Amaro opposite Bertioga, but this had been left unfinished since no one could be found to serve there. The Portuguese, learning that Hans Staden was a gunner, offered him a good salary and a promise of royal favour if he would take charge of the place, which he agreed to do for four months, by which time Thomé de Souza, the first governor-general of Brazil, was expected to arrive. Hans Staden took possession and with three companions guarded the fort safely until de Souza landed. He was then persuaded to continue his employment for two years more, after which he was to be sent home on the first ship returning to Europe. One day, while he was out hunting, he was surrounded and captured by the hostile Tupinambá, and it is with this episode and its consequences that the main portion of his book is concerned. off to their settlement at Ubatuba, to the south of San Vincente, his eyebrows were shaved off with a piece of glass, and soon his beard disappeared as well, and it was obvious that he was to be killed and eaten. He seems during his two years of enforced idleness in the harbour of Santa Catharina to have learnt the Tupi language, and he protested indignantly that he was not a Portuguese at all, but a German, and an ally of the French who were the friends of his captors. The savages replied with some point that he had been taken from a Portuguese settlement, and, as one of the chiefs remarked afterwards, the dory was an old one, for he himself had caught and eaten five Portuguese, all of whom had protested that they were Frenchmen and yet they lied. One faint hope remained. There was a French trader in the neighbourhood who was brought in to determine the prisoner's nationality. He addressed Hans Staden in French, which the latter did not understand, and forthwith, without further enquiry or delay, abandoned the wretched man to his fate, telling the savages that he was indeed a Portuguese, their enemy and his, and that the sooner he was eaten the better. We next see the prisoner hopping with his legs tied together in and out of the huts, while his tormentors felt his flesh and quarrelled as to who had the best right to the fattest bits. Hans Staden sang a hymn and prepared for death, but was saved for the moment by a timely attack of tooth-ache which prevented him from eating, and he grew thin. while he was away on an expedition, and sickness seized the whole of his party. There had already been some talk about the man in the moon looking down angrily upon the savages' huts, and now the sick chief sent a messenger to ask the prisoner to tell his God to make him well again. No one can blame Hans Staden for making the most of his opportunities, and he played his cards with caution and skill. He replied that his God was indeed wrath with the chief and his people because they had called him a Portuguese and had threatened to eat him. Nevertheless, he went about laying his hands on the sick, and although his ministrations were not wholly successful, for many of the sufferers died, yet the chief recovered, and Hans Staden's stock began to rise. They told him their dreams. One chief, who on an earlier occasion had partaken so freely of roasted Portuguese that his digestion was permanently impaired, was much perturbed at his terrible nightmares and vowed that he would never touch Portuguese flesh again. Even Hans Staden's great enemy, a chief named Alkindar, on promising to mend his ways, was cured of eye-ache. Then the French trader returned collecting feathers and pepper, and he so far repented of his previous conduct as to tell the savages that Hans was indeed an ally of his people and that they had better let him go. But the Tupinambá were not going to part with their prophet, and the Frenchman departed alone. received a hut and furniture and was provided with a wife. Meanwhile his captors visited him frequently and examined him to see which of his limbs and joints they proposed to claim. His children were reared and might or might not suffer the same fate as the father. When all was ready invitations were sent out to the neighbouring tribes to partake of the feast. The club with which the victim was to be dispatched was adorned with tassels and smeared with pounded egg-shells and then religiously secluded. The executioner painted himself grey with ashes and adorned his body with feathers, and after he had dispatched the prisoner (who was expected to show complete indifference to his fate), blood was drawn from the slayer's arm, and he was forced to retire to his hut for a time and lie in his hammock, amusing himself with a miniature bow and arrow to keep his eye in, this practice of seclusion and purification being intended doubtless to protest him from the angry ghosts of his victim. These rites and ceremonies, having been described by an eye-witness, are extremely valuable. Unfortunately the writer has added a wealth of detail which is merely sickening. He was determined that not a fraction of the horrors he had escaped should be lost on his readers. hope that God would forgive these men, but it is clear that he could not bring himself to do so, and on learning that the ship must have foundered on the return voyage he remarks only that such cruelty and want of pity could not go unpunished. When the next French ship arrived, however, he found himself among friends. By means of a clever ruse he contrived to be taken on board, and finally, amidst the lamentations of his captors, in whose hands he had remained for nearly a year, he commenced his homeward voyage. His perils were not yet over, for he was severely wounded in a skirmish with a Portuguese vessel in the harbour of Rio de Janeiro, but finally on February 20, 1555, he landed safely at Honfleur. From Honfleur he travelled to Dieppe, returning to Germany by way of London and Antwerp. Of his subsequent life nothing of importance is known, but he must have settled down almost at once to write his history. to keep up the supply of cunning women, and in Chapter XV, Part II there is an early reference to the tradition of the visit of St. Thomas the Apostle to America. Hans Staden does not tell the whole story, but when he enquired why the men had their heads shaved like monks, he was told of a mysterious personage who had visited them in times past, working miracles among the people and teaching them many strange things including the use of the tonsure. An unexpected mention occurs in Chapter XXXIII, Part I, of the weeping welcome concerning which there is much in the accounts of early travellers, and which has attracted a good deal of attention in modern times (see Der Tränengruss der Indianer, by G. Friederici, Leipzig, 1907). The book in fact is full of odds and ends of information which give it a special value, quite apart from the story of the author's remarkable experiences and escapes. he was conscious that God was on his side he was a little inclined to be presumptuous and self-centred. He was convinced, when asked to heal the sick, that his prayers would be answered, but he was seriously perturbed how to act, since he could not decide whether it would be more to his interest to let the sufferers die or live. We could wish that one or two episodes, particularly the episode in Chapter XXXIX, where a slave who had lied about him was killed and eaten, had been related in a different spirit, but it was part of the author's belief that all who wronged him should suffer both in this world and the next, and we must be careful not to judge him unfairly. It is certain that he had to face trials and dangers which would have tried the courage of many braver and more imaginative men. He was not a coward, and he really seems to have been more terrified of being eaten than of being killed. In any case we must remember that he willingly undertook the defence of the fort at Santo Amaro, which no Portuguese gunner would face, that he acquitted himself with distinction in action, and that when his captors had taken some Christian prisoners he remained by them to comfort and help them to meet their end, at a time when, apparently, he could have escaped quite easily. The truth of Hans Staden's story does not seem ever to have been seriously questioned, although he obviously expected to be classed among the lying travellers. He is careful in his concluding address to the reader—a most convincing document—to mention the names of all Europeans with whom he came into contact, so that sceptics could check his statements. The learned Dryander, his sponsor, was a well-known man in his day, and he and the Landgrave of Hesse seem to have gone thoroughly into the matter, and to have cross-examined the traveller again and again without shaking him. Moreover, the sources from which even a practised writer could have compiled such a book were very few. Many of Hans Staden's statements are confirmed, in some cases strikingly confirmed, by the French missionary, Jean de Léry, who was actually in Brazil while Hans Staden was writing his book. De Léry accompanied the Huguenot expedition sent out by Coligny. He remained from 1556 to 1558 among the natives and had special opportunities for studying the Tupinambá, whose habits, appearance and language are fully described in his Histoire d'un voyage faict en la terre du Brésil, dite Amerique, published in 1578. It has been stated again and again by Hans Staden's German editors that de Léry, when he met with Staden's book, was so impressed by it that he remarked that he and the German traveller might have compared notes before putting pen to paper. I have searched for the authority for this statement, but I cannot find it. All I can say is that it is hallowed by continued repetition. Nor is it of much importance. The fact is that in every page of his book Hans Staden stands out as his own witness for truth. That he saw what he tells us he saw, and suffered the vicissitudes which he describes, cannot, I think, be doubted by anyone who has read his narrative with attention. since a portrait produced for the first time a century after the sitter lived is open to a good deal of suspicion. It can be found at p. 3 of the facsimile reprint of Staden's book issued by the Frankfurter Gesellschaft für Anthropologie, Ethnologie and Urgeschichte, published at Frankfurt-a.-M. in 1927. WARHAFTIG / HISTORIA UND BESCHREIBUNG EYNER LANDT- / SCHAFFT DER WILDEN NACKETEN GRIMMIGEN MENSCHFRESSEN / LEUTHEN IN DER NEWENWELT AMERICA GELEGEN VOR UND NACH / CHRISTI GEBURT IM LAND ZU HESSEN UNBEKANT BISZ UFF DISEN / NECHST VERGANGENE JAR DA SIE HANS STADEN VON HOM- / BERG AUSZ HESSEN DURCH SEIN EYGNE ERFARUNG ERKANT / UND YETZO DURCH DEN TRUCK AN TAG GIBT. DEDICIRT DEM DURCHLEUCHTIGEN HOCHGEBORNEN HERRN / H. PHILIPSEN LANDTGRAFF ZU HESSEN GRAFF ZU CATZEN- / ELNBOGEN DIETZ ZIEGENHAIN UND NIDDA SEINEM G. H.
MIT EYNER VORREDE D. JOH. DRYANDRI GENANT EYCHMAN / ORDINARII PROFESSORIS MEDICI ZU MARPURGK. INHALT DES BÜCHLINS VOLGET NACH DEN VORREDEN GETRUCKT ZU MARPURG IM JAR M.D.LVII. [Colophon] ZU MARPURG IM KLEEBLATT BEI ANDRES KOLBEN UFF FASTNACHT 1557. Richard N. Wegner), Frankfurt-a.-M., 1927, pp. 19-24. This facsimile was published by the Frankfurter Gesellschaft für Anthropologie, Ethnologie, und Urgeschichte. A short bibliography is appended to the Hakluyt Society's translation issued in 1874. There is an excellent reprint of the Frankfurt edition of 1557 in vol. xlvii of the Bibliothek des Litterarischen Vereins in Stuttgart, 1859, edited by Dr. Karl Klüpfel. Of the early translations we may note a Flemish version printed at Antwerp in 1558. There seems to have been a French translation in 1559, but no copy appears to have survived. Adam Lonicer turned it into Latin for De Bry's collection of voyages in 1593. A Dutch translation appeared in 1563 at Amsterdam which has been frequently reprinted. A new French version was printed in Ternaux-Compans, Voyages, relations et mémoires originaux pour servir a l'histoire de la découverte de l'Amerique, Paris, 1837, vol. 3. The Hakluyt Society, as we have seen, printed an English translation of the work in 1874 by Albert Tootal, with introduction and notes by Sir Richard F. Burton. A Portuguese translation appeared in 1892 at Rio de Janeiro. Hans Staden has received a good deal of study in Germany in recent years. The following works may be noted: Karl Klüpfel's note at the end of the reprint by the Stuttgart Litt. Verein in 1859; Hantzsch, Deutsche Reisende des 16. Jahrhunderts, Leipzig, 1895, p. 57; Julius Pistor, Hans Staden von Homberg und sein Reisebuch (Festschrift der Deutschen Anthropologischen Gesellschaft zur 26. allgemeinen Versammlung zu Cassel), Cassel, 1895, pp. 1-18; Klaudius Bode, Die Tupistämme und ihre Sprache in der Capitania S. Vincente (São Paulo) (published in Korrespondenzblatt der Deutschen Gesellschaft für Anthropologie, Ethnologie und Urgeschichte, Band 69, Nos. 5/8, pp. 51-58), Brunswick, 1918. Dr.
Richard N. Wegner's Begleitschrift to the facsimile reprint issued at Frankfurt-a.-M. in 1927, referred to above, brings together all that is known about Hans Staden and his book, and contains an interesting survey of the earlier and later literature of discovery. Southey in his History of Brazil, London, 1810, devotes a whole chapter (ch. vii) to Hans Staden. There is an interesting notice of Staden in the Allgemeine Deutsche Biographie, vol. 35. It seems to have escaped the notice of Hans Staden's editors that his book was well known to Purchas. In the volume (reprint, vol. xvii, p. 56) containing the extracts translated from another German traveller in Brazil of about the same period, Ulrich Schmidel, whom Purchas elects for the most part to call Hulderike Schnirdel, the editor has added the following note: "I had thought here to have added the Voyages of Johannes Stadius (another German which served the Portugals in Brasill about Schmidel's later time) published in Theodore de Bry; and had the same by me translated. But contayning little light for the Countrie and People, and relating in manner onely his owne Tragedies, in his taking by the Savages, and often perils of being eaten by them, as some of his friends were before his face, with other like Savage arguments wherewith wee have glutted you alreadie: I being alreadie too voluminous, have omitted the same and hasten to other Relations." While taking exception to Purchas's views concerning the general interest and value of Hans Staden's travels, we must indeed regret the loss of a 17th-century version of the book, rendered, we may be sure, with all the raciness and style which characterizes every page of "Purchas, His Pilgrimes." To be able to describe the roasting and eating of human beings as a "Savage argument" is a luxury denied to the translator of today. 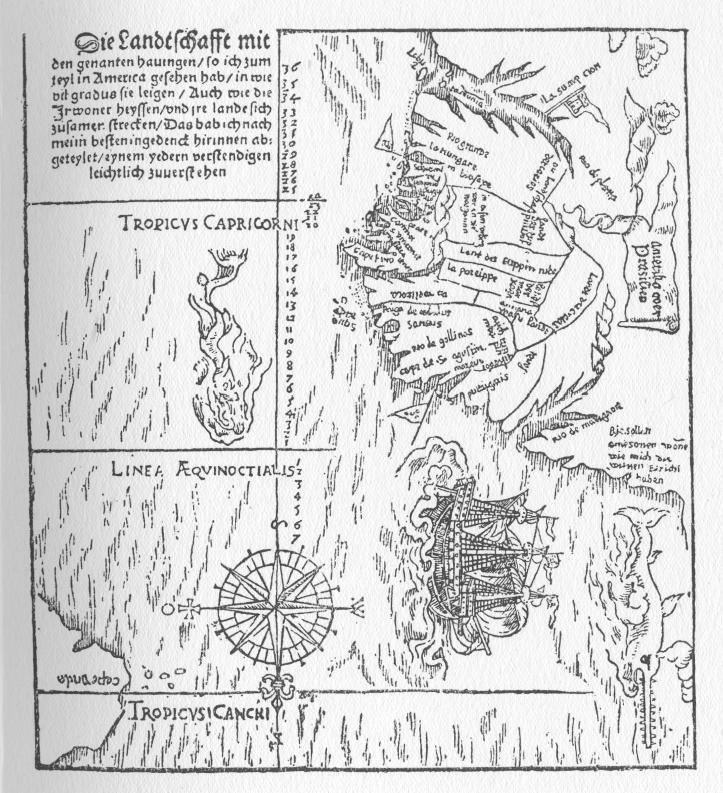 THE TRUE HISTORY AND DESCRIPTION OF A COUNTRY OF SAVAGES, A NAKED AND TERRIBLE PEOPLE, EATERS OF MEN'S FLESH, WHO DWELL IN THE NEW WORLD CALLED AMERICA, BEING WHOLLY UNKNOWN IN HESSE BOTH BEFORE AND AFTER CHRIST'S BIRTH UNTIL TWO YEARS AGO, WHEN HANS STADEN OF HOMBERG IN HESSE TOOK PERSONAL KNOWLEDGE OF THEM AND NOW PRESENTS HIS STORY IN PRINT. DEDICATED TO THE SERENE AND HIGHBORN LORD, LORD PHILIP LANDGRAVE OF HESSE, COUNT OF CATZENELNBOGEN, DIETZ, ZIEGENHAIN AND NIDDA, WITH A PREFACE BY D. JOH. DRYANDER, CALLED EYCHMAN, PROFESSOR OF MEDICINE AT MARBURG. These see the works of the Lord and his wonders in the deep. He maketh the storm a calm, so that the waves thereof are fill. the savage peoples of Brazil called Tupin Imba, eaters of men's flesh, who took me captive and whose prisoner I was for nine months amidst many dangers, and who delivered me in safety through their Holy Trinity by means wholly unlooked for and most wonderful. I thank God also that now, after so much misery and danger, I am once again after many years in these dominions, my beloved home, where I hasten dutifully to give an account of my travels and voyages, which I have described as briefly as may be. I trust that your Highness may be pleased to have read aloud at your leisure the story of my adventures by land and sea, if only on account of God's wonderful mercies vouchsafed to me in my distress. And lest your Highness should think that I have reported untrue things, I venture to offer your Highness at the same time a sponsor for my veracity. To God alone and all in all be the glory. I commend myself to your Highness in all humility. Dated at Wolfhagen, the twentieth day of June, Anno Domini, Fifteen Hundred and Fifty-Six. Your Highness's subject Hans Staden of Homberg in Hesse, now a burgher of Wolfhagen. To the noble Lord, the Lord Philip Count of Nassau and Saarbrücken etc. his gracious Master, D. Dryander2 sends greeting and the expression of his duty. Hans Staden, who now offers this history in print, has asked me to read his work, to revise it and where necessary to correct it. I have complied with his request for various reasons. Firstly, I have known his father for upwards of fifty years, for he and I were born and taught in the same town, namely Wetter. Both in his home and in Homberg in Hesse, where he now lives, he is looked up to as an upright, pious and worthy man and not unversed in the arts. As the proverb says: "The apple tastes of the tree." It is to be expected, therefore, that the son of so worthy a man should resemble his father in virtue and piety. purpose of the work, that men may see how mercifully and against all hope the Lord God delivered Hans Staden, who called upon him, out of so many and great dangers; how he rescued him from the savage people in whose power he lay for nine months in daily and hourly expectation that he would be killed and eaten, and how he restored him in safety to his father-land in Hesse. For these unspeakable mercies he desires, as far as in him lies, to give thanks to God and, praising him, to make his blessings known to all men, and in the laborious ordering of this work to relate in detail his journeys and the chances which befell him during his absence of nine years from his country. All this he relates simply and without ornament or great words or arguments, a fact which impresses me with the truth of what he describes. I do not see what advantage he could obtain by lying, even if he preferred falsehood to the truth. false and lying history, he will be able to put him to shame and denounce him as a worthless person. I will now leave the weighty arguments and conjectures which support Hans Staden's integrity and consider briefly why it is that histories of this kind receive generally so little credit and applause. In the first place, land travellers with their boundless falsehoods and reports of vain and imagined things have so wrought that honest and worthy people returning from foreign countries are now hardly believed. For it is commonly said: he who desires to lie, let him lie concerning far off things and places, since few travel into distant parts, and a man will sooner credit what he hears than undertake the labour of finding out the truth for himself. But let it not be assumed that truth is to be silenced by falsehood. It is to be noted that many matters appear to the common people to be incredible, yet when they are disclosed to men of understanding and thoroughly tested they are found to be known and proved, and to be in themselves worthy of credence. This fact is clear if we take two examples from astronomy. We who live in Germany or in adjacent countries know by long experience the duration of winter and summer as well as of the two other seasons, autumn and spring. Item, how long is the longest summer day and how short the shortest day of winter; also in the same manner the duration of the nights. than the whole earth, nor can their number be measured:—when the common people hear these things they condemn them as impossible and not to be believed. Yet these are matters within the knowledge of astronomers, and no one skilled in science can doubt that they are true. It does not follow, then, that these things are false because the common people think them so. Nevertheless, the science of astronomy would stand low indeed if persons who profess that science could not foretell the times of the eclipses and when and for how long the sun and moon shall be darkened. These happenings have been foretold hundreds of years in advance, and men have found them to be correct. Yet some will say: "Who has traversed the heavens and measured them and beheld these things?" To this I make answer that the experience of every day confirms the evidence of the learned, as clearly as I can demonstrate that two and three make five. Facts and scientific demonstrations have established that it is possible to measure and calculate the situation of the moon, the distance of the planets, and the height of the starry heavens, the size and circumference of the sun, moon and other heavenly bodies, and with the aid of astronomy and geometry to establish the distance, circumference, breadth and length of the earth itself. Yet these matters are hidden from the common mind and are generally believed to be impossible. The ignorance of the ordinary man may be attributed to the fact that he has no knowledge of philosophy, but that learned and scientific persons should doubt of matters so definitely established is both shameful and dangerous, for the common man looks up to the learned and observes their dissensions, remarking: "If these things were true, so and so would not have disputed them." Ergo, etc. holy and learned men as well in theology as in the arts) doubted the existence of the antipodes. They denied that men could inhabit the opposite sides of the earth and exist beneath us, walking with their feet uppermost and their heads hanging down towards the skies without falling off. This may indeed sound strange, but learned men questioned it, and it has been found to be true in the face of the denial by the holy and learned authors I have named. For it follows that those who live ex diametro per centrum terræ must be antipodal, for omne versus cœlum vergens, ubicunque locorum sursum est. Nor is it necessary for us to travel downwards unto the New World to seek the antipodes because they are here in the upper half of the globe. For if we consider together and compare the uttermost countries of the West, namely Spain and Cape Finisterre, with the East, where lie the Indies, we find that these opposing peoples and inhabitants of the earth are in their way antipodes. the lower hemisphere beneath us is buried deep down in the sea and is without life. But all this is contrary to the science of cosmography, for the many voyages of the Spaniards and Portuguese have established the exact opposite, that the globe is everywhere inhabited, yea, even the Torrid Zone which our forefathers, and indeed all writers of old, would not allow. Our daily supplies of spice, sugar, pearls and similar commodities are brought to us from these countries. I have been at pains to explain the paradox of the antipodes and the measurement of the heavens in order to support my argument. There are many other matters which I could bring forward at length if I desired my introduction to be tedious to you. These and similar arguments may be read in the book written by the worthy and learned Magister Caspar Goldtworm,5 your Highness's diligent superintendent and chaplain at Weilburg, which book is divided into six parts and treats of miracles, wonders, and paradoxes of former and present times, and which will shortly be printed. To this work, and to many others dealing with such matters, such as Libri Galeotti, de rebus vulgo incredibilibus,6 I refer the friendly reader who desires further instruction and understanding. Let it be made clear that matters which are strange and ridiculous to the common mind must not straightway be condemned as lies. The island people described in this book go naked; they have no domestic beasts for food, none of those things, in fact, which are common to us for the support of the body, such as clothes, beds, horses, pigs or cows, not even wine and beer, but they contrive to maintain themselves in their own way. has been moved to complete and print the story of his two voyages. Some may take it amiss, as if the writer desired his own glory or to make a great name for himself. I know that this is not so and that his disposition, as appears from several indications in the history itself, is very different. Such was his misery and so great his adversity, and so constantly was his life in peril and the victim himself without hope, that he had abandoned all expectation of gaining his liberty, or of seeing his home again. Yet God, in whom he trusted and upon whom he called, did not leave him helpless in the hands of his enemies, but was moved also by his prayers to manifest himself to the heathen, that they might see and know that the only true God, mighty and all-powerful, was at hand. To the prayers of the faithful there is neither limit nor restraint, and it pleased God through Hans Staden to show his mighty works among the heathen. This, in truth, cannot be denied. him: "If he delivers me from this, he will not get so much as a farthing candle from me." Another dory concerns a knight, who was also in danger of shipwreck, and it is as follows. This knight, when he saw that the ship was about to founder, called to St. Nicholas and vowed that if he would save him in his need he would offer him his sword or his page. His squire thereupon reproached him and asked him how he would ride abroad if he did this. "Hold thy peace," said the knight under his breath, led the saint might hear, "let him only save me, and I shall not give him even the tail of my horse." So did these two make their plans to deceive their patron saints, intending to forget speedily the benefits vouchsafed to them. Led Hans Staden should be regarded as a man ready to forget his mercies now that God has succoured him, he desires in printing his history to give honour and praise to God alone, and in all Christian humility to make known to men the mercies vouchsafed to him. If this were not his intention (which is indeed both honourable and fitting), he would surely have spared himself the labour and time, to say nothing of the charges of printing this work and cutting the blocks, which alone have been considerable. that appertains to astronomy and cosmography, I have therefore addressed my preface to your Highness, begging that it may suffice until such time as I am able to publish in your Highness's name something more weighty. I subscribe myself in all humility. Dated at Marburg on St. Thomas's Day in the year MDLVI. 1. Of the two voyages which Hans Staden undertook in eight and a half years.7 The first journey was from Portugal, the second from Spain to the New World of America. 2. In what manner he was carried to the country of the savage people Toppinikin (who are subject to the King of Portugal), where he was employed as a gunner against the enemy; and how at last he was captured by the enemy and carried away and remained for nine and a half months a prisoner with them in danger of being killed and devoured. 3. How God in merciful and wonderful manner delivered him from his enemies and restored him to his fatherland. All which is now related in print to the honour and glory of God and in thankfulness for his wondrous mercies. 1 Philip I, the Magnanimous, of Hesse was born in 1504 and died in 1567. He was the founder of the University of Marburg. 2 Dryander, or Eichmann, one of the most famous of German anatomists, was born at Wetterau, studied medicine at Bourges and Paris, and about 1533 was practising as a doctor at Mainz. In 1535 he settled at Marburg where he taught as Professor for twenty-four years with great success until his death in 1560. He was eight times Rector of the University, whose affairs he administered with an experienced and practical hand. Dryander was a keen student of astronomy and delighted in everything relating to travel and discovery. See H. Hermelink and S. A. Kaehler, Die Philipps-Universität zu Marburg (1527-1927). Fünf Kapitel aus ihrer Geschichte. Marburg, 1927, p. 139 ff. 3 This was Helius Eobanus Hessus, humanist, born 6 January 1488 at Bochendorf in Hesse. He died 6 October 1540 at Marburg. His son Heliodorus, who early developed a roving disposition, was born in 1529, and in 1548 he left Europe for Brazil, where he was engaged as a clerk in a sugar plantation near San Vincente. He was lost sight of for some years. In 1565 he led a troop of "Mamelukes" and Indians to Rio de Janeiro to the assistance of Estacios de Sá against the French, after which he seems to have remained at Rio. See G. Schwertzele, H. E. Hessus, ein Lebensbild aus der Reformatzionzeit. Halle, 1874; C. Krause, H. E. Hessus. Gotha, 1879. 4 A Franciscan who died in Paris in 1340. He cleansed the Bible of unfitting expressions. 5 Goldtworm was a Lutheran preacher. He is known as the compiler of a church calendar, but his promised book on miracles and wonders does not seem to have been printed. 6 Galeotti-Mario, astronomer, Professor at Bologna, c. 1440. He died in 1494. 7 The eight and a half years must refer to the period between Staden's first leaving home and his final return. The first voyage lasted sixteen months, from 29 April 1547, when he set out from Kampen, to 8 October 1548, when he arrived back in Lisbon (ch. v). 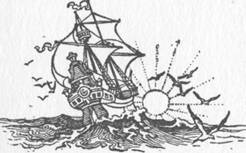 The second voyage lasted for about six years, from the fourth day after Easter 1549 (ch. vi), to 20 February 1555, when he reached Honfleur (ch. lii).